Now that collectors are getting their first taste of 2011 Topps Finest Baseball, the product is showing plenty of hot rookie autographs. Although it looks like Eric Hosmer is a redemption, there's still plenty of other on-card options packing out. Among the signature rookie highlights are Dustin Ackley and Michael Pineda of the Mariners, Mark Trumbo, Mike Trout, Freddie Freeman and Jerry Sands. Making the chase even more challenging are the many Refractor parallels. Especially striking are the Orange Refractors numbered to 99 and X-Fractors numbered to 299. 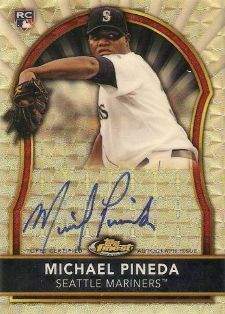 The one-of-one Pineda Superfractor has already surfaced.